For high quality, ultra-clean porta potty rentals in Texas City, businesses, construction sites and special event venues turn to Texas Waste Co. We are a local company that works to support the community by providing the absolute best porta potty rentals, hand wash station rentals or restroom trailer rentals for business or event use. And because your reputation depends on the experience you provide for others, we take the delivery and maintenance of our portable sanitation party rentals very seriously. After all, the success of our business depends on the success of yours! We aren’t looking to simply provide a single exemplary experience for residents of Texas City. We want to build lasting relationships so that the community always has a reliable source for porta potty rentals, hand wash station rentals or restroom trailer rentals. Even porta potty brokers turn to Texas Waste Co. for their supplier needs. We have become a name in sanitation that is trusted throughout the community and the industry. A simple cost structure leaves nothing to question and fast, friendly delivery can be depended upon, same day or pre-scheduled. The next time you need quality, hygienic portable toilet rentals in Texas City, contact Texas Waste Co.
Texas City is a busy deepwater port that also hosts a petroleum refining and manufacturing center. It was founded in 1891 by three brothers who were duck hunting near Shoal Point. They established the city in 1893 by raising money through investors in Minnesota. Texas City is well known because of an explosion in 2005 that devastated the country’s third largest oil refinery, killing 15 people and injuring more than 100. If your looking for the best service and prices for porta pots in Texas City we have them. 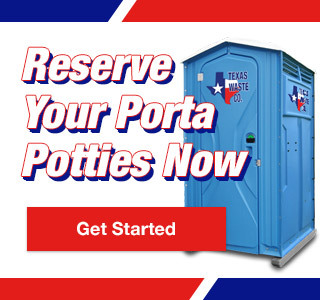 Texas City – Porta Potty Rentals Available Now!